Since my writing partner, Jay Holmes, is a covert intelligence operative, we often meet and work in remote locations. The day after Valentine’s Day found us plotting our next novel while we hiked up a cliff in a remote section of a desert. Near the top, I noticed a rose. Yes, a rose. In the middle of nowhere. Then another, and another. 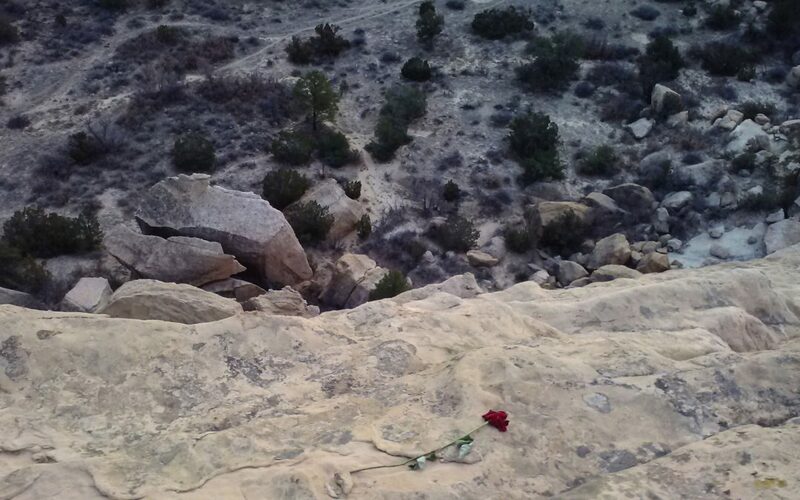 A trail of four roses that led to the very edge of the cliff. Dixie arrived first and watched the sunset from the edge of the cliff, remembering Orlando’s kiss. Just because they had met at a meth lab three weeks ago…Just because they were only sixteen…Just because they were cousins…None of that would keep them from testifying and entering witness protection together before the baby was born. Surely he would make her a Valentine’s bride. Furious, Dixie flung the roses at Orlando with such force that she lost her balance and toppled over the cliff. The mountain lions rejoiced. We agreed to leave the romance to you and to USA Today bestseller Vicki Hinze. So today, we offer you a flash fiction challenge. Next Wednesday, March 5, come back and vote for your favorites. USA Today bestseller Vicki Hinze has generously donated three copies of one of my own favorite books, Down and Dead in Dixie, about a young woman who stumbles into the middle of a mob turf war and finds out that to live, sometimes ya gotta die. “Dixie” and “witness protection” are some clues as to what you will find in this clever, humorous novel. Cheese grater? Nothing to do with Vicki Hinze’s book, and everything to do with a reason to throw flowers at a boyfriend. But that’s another story. Naked, bleeding, trembling, and frightened-out-of-her mind; Dixie teetered at the cliff’s edge with a pitcher of margaritas in one hand and a single red rose in the other. Behind her stands 350 pounds of hate, the stranger who had been stalking her for the last 9 years and who dragged her out of witness protection to bring her here. He says, “One last drink, my sweet, before we fly over this cliff together and crash like cheese grater at the bottom.” As he lunges for her throat she swings the margarita pitcher smacking him hard on his temple. Arms wheeling, he falls screaming over the side, landing with a deafening crunch. She drops the rose and falls to her knees, happy to be alive and rid of her torment. Death by margarita. Tom flexed his jaw and refused to look away. Dixie swallowed the dry mountain air. Had he brought her to these uncomfortable heights just to tell her to do what she’d refused four times? She slammed the roses into his chest. They fell to the ground, petals still intact. She turned away. “Take us home.” She hated the thought of wrapping her arms around him on his motorcycle. His sigh trickled her neck. She stiffened. She screamed. She struggled. The cliffs scraped her skin bloody like a cheese grater. That was evil. Now I want an entire book with that story. Haha, thanks 😀 I guess the next scene would be him trying to divert the conversation away from the missing mother as he feeds the daughter pasta bolognese. Of course, she didn’t shut up. She never did. A nice whack with the tire iron would do the trick, he thought. He’d bring a rose to this very spot every year on the anniversary of the tire iron freedom manuever. “Well? Is it fixed? ” Carol Ann screeched in his ear. His fingers tightened around the tire iron, then relaxed. The morning sun crept over the distant mountains as Dixie sat next to a tent sipping coffee & dabbing her swollen eyes. Beyond the fire a lizard poked its head over a paper plate and nibbled on a stale cheese grater. A vase of red Valentine roses looked out of place next to the cactus and endless grays & browns of sand & rocks: the only green was on its leaves & the body of her jeep. Ever since she’d entered the witness protection program this was Tim’s & her favorite spot, where they had planned to wed.
She leaned and yanked the flowers from the vase, bolted to her feet and to the cliff, stems dropping all the way. Raising her arm she was ready to heave what was left when she noticed a black car winding up the narrow road. Looking over the edge of the cliff at victim number 6, Detective Bayard thought to himself “I have no choice now! I must convince Dixie to go into witness protection before she is the next victim.” His partner, Detective Holmes was busy scaling down the cliff to get what little evidence was on the ledge. Seriously? Another cheese grater? What is the significance of a cheese grater? Just like the last 5, all Holmes finds is a single red rose, a dead female and a cheese grater. After six years in witness protection, Diane was free. She moved home and reconnected with loved ones. She rescued a dog and named her Dixie, and they had lovely walks by the cliff near her house. Diane met Peter. It was love. Peter seemed smitten also. “You’re special,” he told her. Diane and Peter went for walks by the cliff. They watched the sun go down and threw sticks for Dixie. Peter gave Diane a rose each month. “It’s not you, it’s me; we can still be friends.” Peter said. Diane beat Peter to death with the cheese grater she always carried. She left the roses by the body. The judge ruled justifiable homicide and she got probation. Moral of the story…Don’t tell a lady you just want to be friends. LOL. I had fun with this, and I’ve enjoyed the other stories too. Dixie was conflicted about being on The Bachelor, but she wanted the chance to meet her Prince. And that she did. Thor was very CALIENTE and had cheese-grater abs. The problem was, that he was a spy in Russia during the Olympics and they were ‘on’ to him. Putin blamed Thor for the 5th ring not lighting up during the opening ceremonies and was not happy. Thor was about to give Dixie the FINAL ROSE. If she accepted the rose, she would enter the program with him (no TVs allowed in the witness protection program), if she didn’t, she would have to let him go, forever. After much pondering, Dixie decided that she could NOT miss the Oscars, and opted for the RED CARPET rather than the RED ROSE. She kissed him goodbye and ran home to watch the E channel. Thor was devastated and jumped off the cliff.